Do you want to improve your writing for the web and make your copy as bold and clear as possible? Then try running your text through Hemingway Editor. This online app highlights common errors and suggests ways to tighten up your writing and strengthen the copy. It uses principles followed by the writer Ernest Hemingway, who was known for his simple, yet strong and direct, prose. In this blog post, I’ve outlined a few ways we can benefit from these principles when we write for the web. 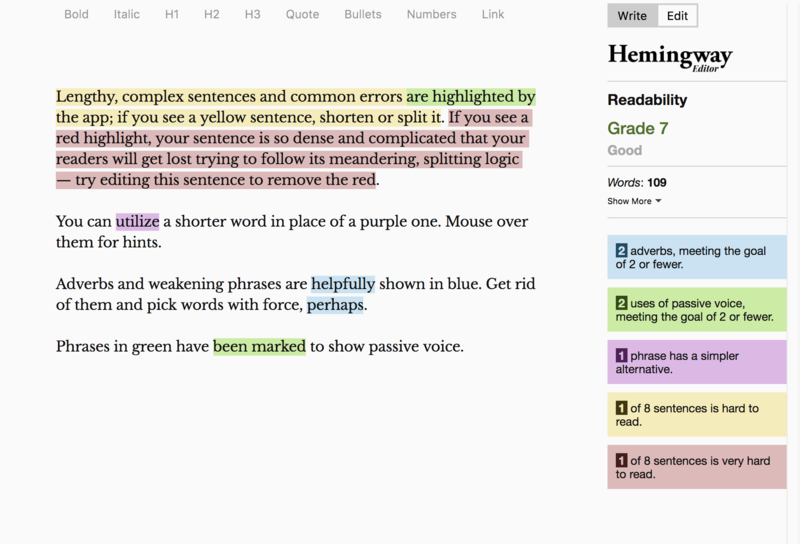 Cut and paste your copy into the Hemingway editor. The app will then check it. If you see text highlighted in yellow, this means you’ve written a long or complex sentence. You can see at a glance that you need to shorten these sentences or split them up into more than one. Long, rambling sentences obscure your meaning. Copy is clearer and more persuasive when kept simple. If you see text highlighted in red, your sentence is too dense and complicated. You will need to rewrite any sentences in red. It’s very easy to write a lot of content in the passive voice. What do I mean by this? The bear chased the girl. The troll saved her. The girl was chased by the bear. She was saved by the troll. Active writing, as in the first example, is where the subject performs the action on the object. The bear (subject) chased the girl (object). It is easy to see immediately who is doing what. In the second sentence, the girl is the subject. However, she is not doing anything. Instead, she is being acted upon by the object which is now the bear. You can see that this removes some of the energy from your writing which is not what we want online. Instead, it is better to keep our writing lively. This encourages readers to respond with greater urgency. The passive voice also makes it harder for readers to grasp who is doing what. We don’t want our users wasting precious microseconds deciphering our meaning. Hemingway helps us out by highlighting any examples of the passive voice. The app will suggest that you keep instances of this below a certain number, depending on the length of the text. You might not want to remove them all, just cut them down. Ernest Hemingway avoided using adverbs, and author Stephen King claims “the road to hell is paved with adverbs”. Why? He sped down the motorway. Hemingway will highlight adverbs and phrases which weaken the force of your writing. Again, you might it find helpful to include a couple of these, but you don’t want the text to be littered with blue highlights. are also highlighted. You can often remove these without losing any meaning. This will make your text more forceful. If we’re trying to market a course or encourage people to do something (e.g. attend an event, sign up for more information) we want our text to be as forceful as possible. Hemingway will provide you with a readability grade. This is the minimum level of education that readers need to understand your material. In general, you want to keep the readability grade low to help readers absorb the information. If the grade level is high, it suggests that the material is wordy, convoluted, and full of jargon. However, if you’re targeting a postgraduate or research audience, you might be using specialist terms which raise the readability level of your material. Consider your audience and use your own judgement too. Finally, Hemingway gives you basic stats such as word count, and also the time taken for an average user to read your page. This can be useful if you’re trying to keep your content short. We find Hemingway a useful tool when writing for the web, but like any automated tool, it can only do so much. Before publishing anything, it’s also recommended that you ask a real person to proofread your text – ideally someone with no prior knowledge of the subject you’re writing about – to ensure that you’ve successfully communicated your message in as clear a manner as possible. I have only come across Hemmingway Editor 3 for $19.99. How do I access the free online version, please? Hi Beverly, the free version is the web based version rather than the downloadable version. Hi Pete, could you tell me what is the link to web based version. I found this http://www.hemingwayapp.com/desktop.html but it is not free. Thanks! It used to be free now you have to buy it and it cost $19.95.